Offensive and derogatory or just a bit of harmless fun? The word banter is more than 300 years old but is increasingly finding itself under the spotlight, with questions being asked about its true meaning. The word is believed to have originated in London as street slang and has evolved to its current form, defined by the Oxford Dictionaries as "the playful and friendly exchange of teasing remarks". But some would say a more sinister use of the word has developed alongside this - one which was pointed out by teacher Mike Stuchbery. Mr Stuchbery made a stand against banter, saying it had become an "excuse for inappropriate behaviour" in his classroom, in Gorleston, Norfolk. "If I catch somebody nicking someone's pencilcase, calling another student a derogatory name or thumping them on the back, nine times out of ten I'll be met with a 'Siiiir, it's just bantaaaaaaah! ", he wrote on his blog. Following nationwide media coverage, Mr Stuchbery left the school by mutual consent. Author and journalist Musa Okwonga said the evolution of the word was partly the work of magazines such as Loaded and Nuts. "The lads' mags may have gone now but their legacy was this demeaning commentary disguised as jokes," he said. "Banter blurred with innuendo." He said this banter usage was propelled by comments made by Premier League manager Malky Mackay, and before that Andy Gray and Richard Keys, who made sexist comments about a female referee. "The defence about the comments was that it was just banter," Mr Okwonga said. "That showed the extent that it was acceptable, that someone in the public eye who works for a major broadcaster thinks that it's totally fine to use this language in the circle he was living in." Mr Okwonga believes the type of humour now described as banter is now firmly established in the mainstream, citing as an example the success of the comedian Dapper Laughs, whose popularity on YouTube saw him offered an ITV2 show which was then pulled following complaints about his behaviour. "There was a guy who was a mainstream character, with hundreds of thousands of subscribers on YouTube," he said. Image caption Richard Keys (right) said his and Andy Gray's "prehistoric banter" was "not acceptable in a modern world"
Although he questions whether banning words is the way forward, Mr Okwonga said Mr Stuchbery was right to make a stand. "I think he was making an important point," he said. "People say 'ah it's only a joke', but there are plenty of jokes that don't involve prejudice." Luke Wright, a poet and broadcaster, said banter had become "more downmarket than it used to be". "It's something I used to say quite a bit but it's taken on quite a laddish connotation now," he said. "I don't like it anymore. "You've got the Dapper Laughs stuff and all the misogynist talk, it's become quite a loaded word." Mr Wright said he appreciated teachers being at their "wits' end", but said banning a word was "stupid". "To ban something can give it all the more power," he said. "Words go round and round all the time, meanings change, and so does the context. "With kids, the words that everyone is saying now they won't be saying in three months' time, so you've just got to ride it out." Daniel O'Reilly, the comedian behind Dapper Laughs told BBC Newsnight he would no longer be performing as the character after his banter "got carried away". "If that was the first time I'd seen that kind of comedy I would think the character was not setting a good example, but at the time we were doing it it was getting so much praise by the audience," he said. "It was something that took hold of me... I was creating the character and pushing the boundaries because it was quite popular." 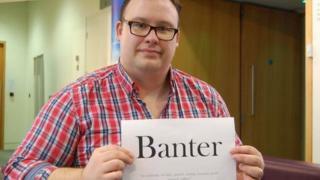 John Bangs, the former head of education at the National Union of Teachers, said banter had become a "convenient word to cover up bullying and harassment". "It's becoming a popular word which could cover up a whole host of more problematic meanings," he said. "You might call it a cover word, to deflect any investigation into what you're doing if you're a kid who wants to get involved in something naughty." Image caption Malky Mackay said his offensive messages were "friendly text message banter"
The Oxford English Dictionary says that banter means "to make fun of (a person); to hold up to ridicule, 'roast'; to jest at, rally, 'chaff'. Now usually of good-humoured raillery". The word is believed to have been first used in street slang in London in the 17th Century. One of its earliest recorded uses appears in T d'Urfey's Madam Fickle from 1677: "Banter him, banter him Toby. 'Tis a conceited old Scarab, and will yield us excellent sport."